With friends and family calling-in over the weekend to deliver Christmas gifts and cards, I thought I'd make up a pan of hot mulled wine that could be left on the oven as visitors come and go. I promised to share the recipe on the blog and here it is. It couldn't be simpler. 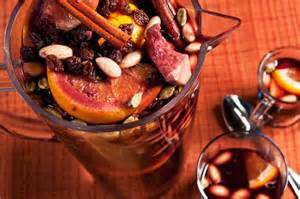 Put the wine in a saucepan with the orange, sugar, bay leaf, cinnamon stick and nutmeg. Taste to see if you want the wine sweeter and add more sugar to taste. Take the pan off the heat, stir in the sloe or damson gin, if you are using it. 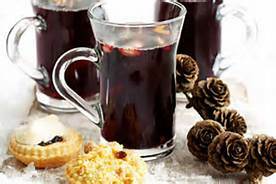 Strain the mulled wine into heatproof glasses and serve with a home-made mince pie.